As dreams go, they are in many respects out of our conscious control, even if lucid dreaming. While individual choice may be available, the context, the dreamscape in which the dream unfolds is often presented to the dreamer, a call to adventure, a risk of the unknown. In this particular dream, I was at the very opening granted a background of strong emotion but few facts, only enough to enabled me to understand the otherwise bizarre terrain and conditions in which I found myself. 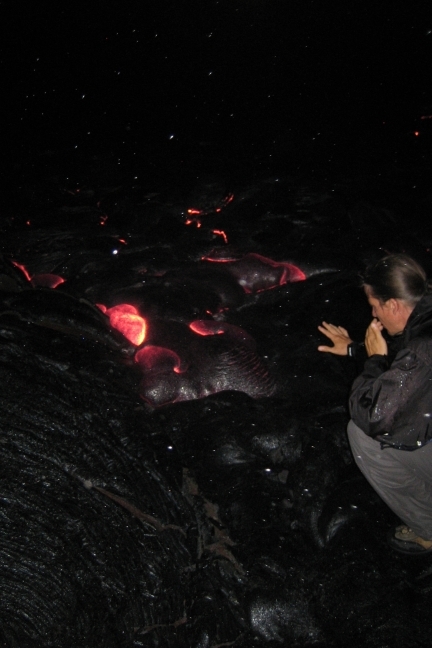 I have inserted my photos of the lava flows below Kilauea, Big Island, Hawaii, taken in 1991 and 2006. I stood a half dozen steps behind Karaen and Chao. Both of them already stripped of their field gear, they wore only light, grey-white pants and a darker, tight, short sleeve top made of the same, synthetic fabric. Chao wore his shirt tucked into his pants while Karaen long ago gave up the regimen of dress code and as I watched, removed her shirt altogether. She stepped back from the fierce heat as it now reached out and tore at her bare chest, burning the ends of her long, black hair. The river of molten rock that passed just to their front, ten meters broad and seemingly just as deep, cut through a red rock canyon uninterrupted by anything living or even reminiscent of life. I was not prepared to watch someone die whom I had come to care for so deeply. So many years in training, living within nearly impossible, cramped quarters, and then exploration of this relentless alien world. Our time together as brothers and sisters, as superiors and lovers left us without need for additional words, our decision set in motion days prior. It reminded me of too many times watching a loved one pack her things in what I cognitively knew was the last goodbye, but inside so many words continued to press against the back of my throat with desire to reconnect and try again. If only I could present the missing solution, the one we had not yet discovered, maybe then we would find a way to stay together, a way to survive this hostile world, to ignore the reality of our situation. There is always a way, I told myself over and over, there is always a way. Our base camp, our shelter, our rations, and our communication back to Earth had been completely destroyed. We had what we could carry on our backs and in our hands, no more. We tried to repair what we could find of our equipment, but there were only the three of us now, with no hope for assistance from an orbiting ship, for it had long ago left for the voyage home. It would be years before anyone would know what had become of our mission, the time required to communicate far greater than the time we had available under any scenario we had explored. Now we sat on the edge of a fast, smooth lava flow moving as a river of silver and black by day, orange and red by night. 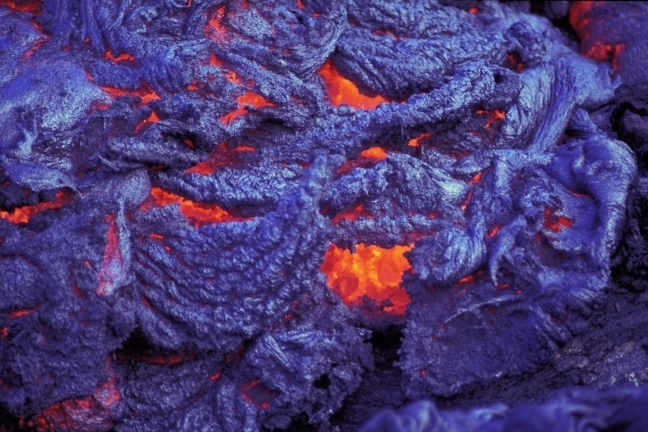 The surface swirled slowly with eddies and bubbles of varying temperature and chemical composition. We had been transfixed for countless hours, without conversation, the two of them steadily moving closer, me remaining further behind, still seeking resolve for a debate long since settled. Suddenly, Karaen took the final few steps to the river’s edge. She didn’t look back to me nor to her right, for we had said goodbye days earlier. I could see that the heat of the river was already burning her bare skin, but she felt nothing then nor when she dove headfirst into the flowing fire. She was nearly instantly consumed, without struggle, without a sound. Only the momentary breath of a dragon as the thick surface of the flow was broken, the molecules of her hair, skin, muscle, bone, and DNA fully consumed. I felt as though I had been kicked in the stomach. I wrapped my arms around myself and twisted from side to side. This is not how it was suppose to end. This is not the dream we had shared. The final three astronauts of a failed mission stranded on a barren, red stone planet whose bold blue sky met undulating cliffs cut not by running rivers of water and life, but by magma which had found its way to the surface through relentless pressure and little concern for time. To my front and right, my final companion did not appear to notice when the lava river was momentarily satisfied by the sacrifice of a human form. He sat on the edge of a rock shelf, palms down at his side pressing to the stone, arms flexing in preparation. His head low and stare forward, he dangled his bare feet above the fire. I did not understand how he could tolerate his position, just a few meters above the surface, for even at my distance I involuntarily turned from side to side, my arms unwrapping in order that my hands could shield my face. Chao raised his head, looked out to the other side of the fiery river, and for just a moment his body was lifted from the rock shelf and suspended from his shoulders. He kicked his legs out and then his body lept down into the lava. Feet, legs, torso, and head disappeared without struggle, a torch of light and sound shooting from the momentary opening his form created. I stood there, alone, weeping, shifting to one leg and then to the other. 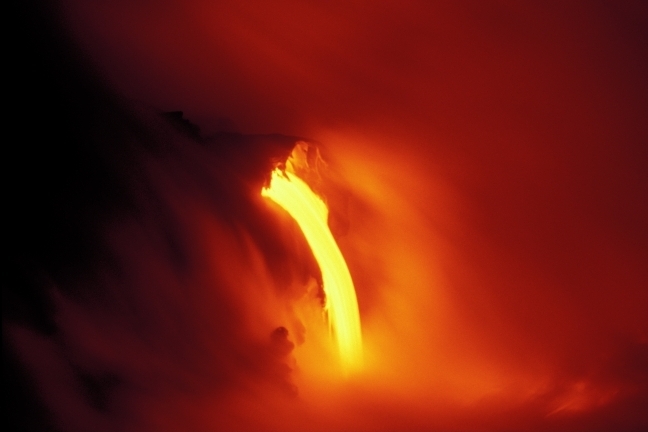 I repeatedly walked toward the river of lava and away again when the heat became too intense. While completely illogical, I scanned the river bank, hoping to see my lost companions resurface. I wanted to join them. I did not desire to be alone, completely alone. I tried to let go, to run and jump without concern for the pending moments of pain. But I could not. My legs simply would not carry me to that end. After an hour, maybe more, knowing I would never again find warmth in the embrace of another human nor share a conversation with anyone but myself, I reached down, lifted my backpack, took what remained of my companions’ rations, then turned and walked up the undulating hill of nearly seamless red stone. Our orbital surveys had shown traces of flowing water in the highlands, and in my mind I pictured fields of green. To this place I would go. Even if it did not exist, I would try. I tightened the familiar straps over my shoulders and linked the waist belt to hold my only chance of survival tight to my body, I climbed up, away from the heat and the fire and the loss, to the intangible sky above the darkening, red horizon.